NEWCASTLE harpist THERESE AITCHISON will perform at THE WETLANDS CENTRE on Sunday afternoon during the WILDFLOWERS AT THE WETLANDS weekend. The weekend is being presented jointly by the centre and NEWCASTLE CITY COUNCIL on Saturday and Sunday between 9am and 4pm. It will feature garden displays, cut flowers and floral arrangements, plant sales, garden planning advice, information about worms and waste, bird-friendly gardens, native orchids and native gardens. 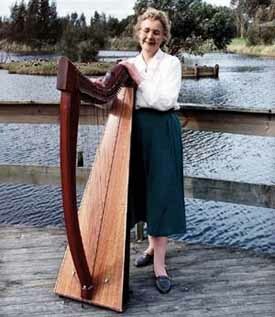 Aitchison will play her 34-string harp, which is constructed of spruce and cedar woods, on Sunday from 12.30pm. Entertainment on Saturday includes a lunch with BUSH POETS. WRITE ON: OVER the past couple of months TE has put out an invitation for budding music writers to contribute stories for these pages. We hope the results will make TE more interesting to more readers. This week we feature four of those names. SAM BARTLETT, a Newcastle University student, previews Friday night's all-ages CRYOGENIC show at The Palais on page 29. Sam also talks to MEL SOMMERS on page 28 about his debut country CD. On page 26 Newcastle musician ANTHONY DEAN reviews the MACH PELICAN gig. Newcastle University student KIM HONAN reports on last week's State University Band Competition on page 27. And KIERAN WICKS continues his weekly reviews of the EXPOZAY band competition at SJ's Hotel on page 27. To find out how to get your story published, phone TE on 4979-5611. PLAYFUL POP: THEY play for fun, they play to party, they are PLAY the band. That's the word on the new trio featuring BOB CORBETT, GUY DEVILLE and JOSH CALLAWAY. PLAY-ing on Wednesday, September 6, at the Ducks' Nuts Hotel, Play performs '90s rock'n'pop songs' by REM, GREEN DAY and NEIL FINN but there's also a goodly dose of THE BEATLES and FLEETWOOD MAC among others. Catch the band again on Thursday, September 7 at the Ducks Nuts and Saturday, September 9 at Wests Leagues Club.